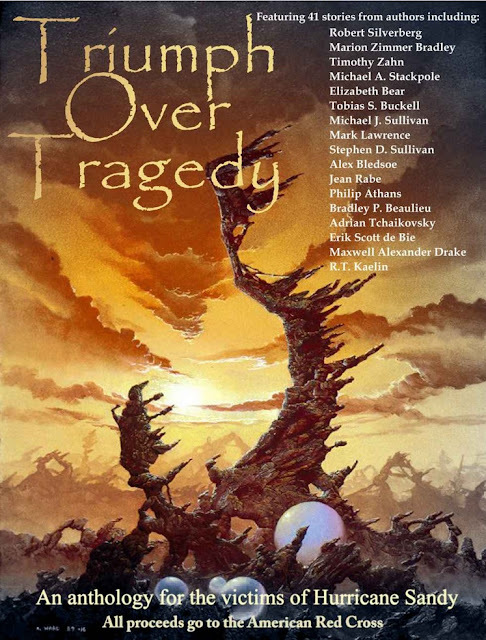 Triumph Over Tragedy, an anthology for the victims of Hurricane Sandy, is officially out now. Not only does it have a new, original science fiction written by me, it also has stories by Michael Stackpole, Robert Silverberg, Michael J. Sullivan, Jean Rabe, Maxwell A. Drake, Timothy Zahn, Elizabeth Bear, Marion Zimmber Bradley, and dozens of others. 40 authors had donations accepted into this collection and I'm quite proud of the piece I contributed. R.T. Kaelin put the whole thing together and contributed a story of his own. He's a class act. For those of you who didn't pick it up on Indiegogo when they had the donation page up, you can get it on Amazon now. I implore you to check it out. It's only $6.99 and contains 40 sci-fi and fantasy stories. There isn't much better you can do with bang for your buck, and all the proceeds are still going to the American Red Cross to aid victims of Hurricane Sandy. Though it's available for Amazon, it will be on the Nook soon. Buy it. Read my story. Read the other stories. Leave a review. My story is called "No Good Deed" and revolves around a starship captain named Arianna and her Dracadian first mate named Bolt who find a mining outpost smashed by asteroids. They're carrying a hold full of illicit cargo for a crime lord on a deadline, should they even bother to stop and help?